Welcome to our site! For the 2019 season, we are continuing to take bookings via www.holidaycottages.co.uk. For the 2020 season onwards, we are taking bookings via a range of other channels and directly. Welcome to Diubaig House! When not let, this is our holiday home and we hope you’ll enjoy it as much as we do. It is peaceful and secluded, and an impressively-sized detached stone cottage, which makes it perfect for a family holiday or romantic retreat. Inside, the house is comfortable, light, and spacious, yet cosy. You’ll enter the house via a hall extension, which gives you plenty of space to leave boots and outdoor clothing. We have kitted out the kitchen as you’d expect to find a home away from home, including local stoneware. There’s comfy seating, a multi-fuel stove, and TV in the living room. There are four generous bedrooms, which can accommodate up to 7 guests. The main bedroom suite is on the ground floor, and has a super-king bed plus en-suite bathroom with shower cubicle, bidet, and toilet. There’s also a separate toilet and utility downstairs. Upstairs, you’ll find the other three bedrooms – a king-size with an en-suite bathroom with over-bath shower and toilet; twin bedroom (two singles, that can be converted into a super-king, depending on your requirements); and a single bedroom. Every bedroom has views of the loch, and high coombed ceilings. There is also a separate shower room with toilet, as well as a study upstairs, should you need some peace and quiet. We have provided a range of DVDs, our favourite board games, books, and guides in the upstairs hall, to keep you busy whilst at home and help you plan where to explore! We have decorated the house with a wide range of twentieth century and contemporary Scottish – including local – art. Outside, our enclosed 3-acre garden contains secluded lawns and seating, and is a haven for wildlife. 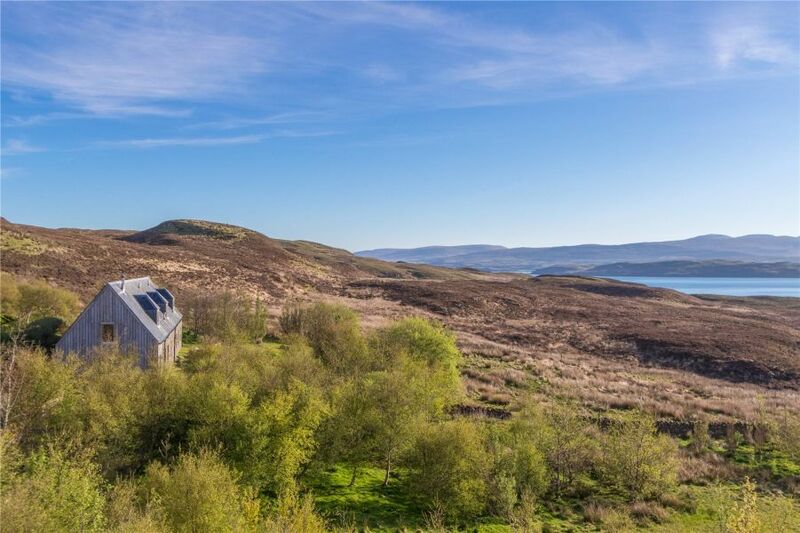 There are exceptional views across Loch Greshornish, and to the Trotternish Ridge. Your children can watch rabbits from the kitchen window, swallows circle the house and young lambs frolic in the nearby fields. There is also private parking for 4 or 5 cars, depending on size. A 20-minute walk behind the house will takes you to the private shores of Loch Diubaig, from which you can see the Ascrib Islands. 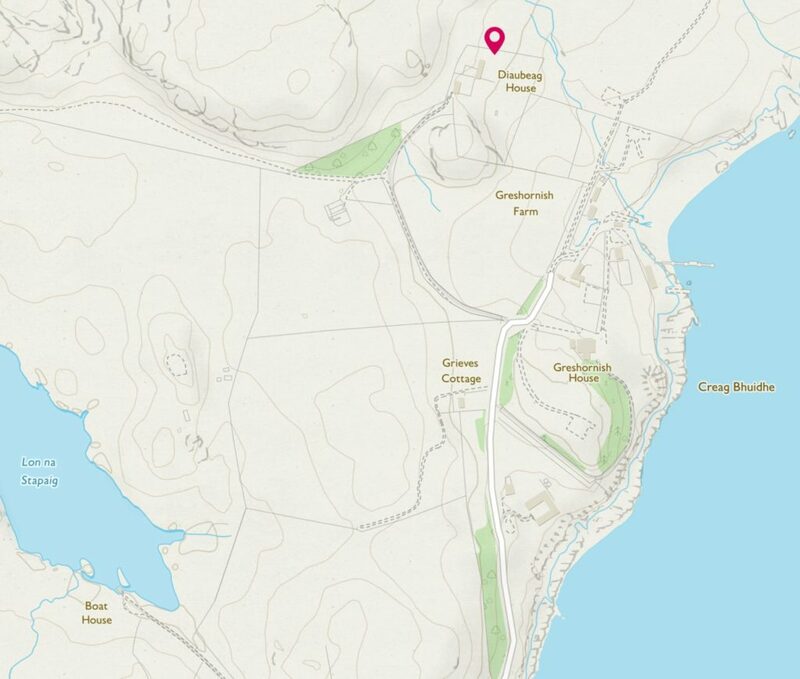 If you continue along the track, you’ll find shells, a ruined cottage, a secret cave, and occasionally see otters in the loch. Of course, we’re also a great base for exploring the Greshornish peninsulas, and the Cuillin hills are a 40-minute drive away. If you don’t fancy cooking one evening, you can amble to Greshornish House, a hotel, in the village.